Recently I have fallen in love with poppy flowers. 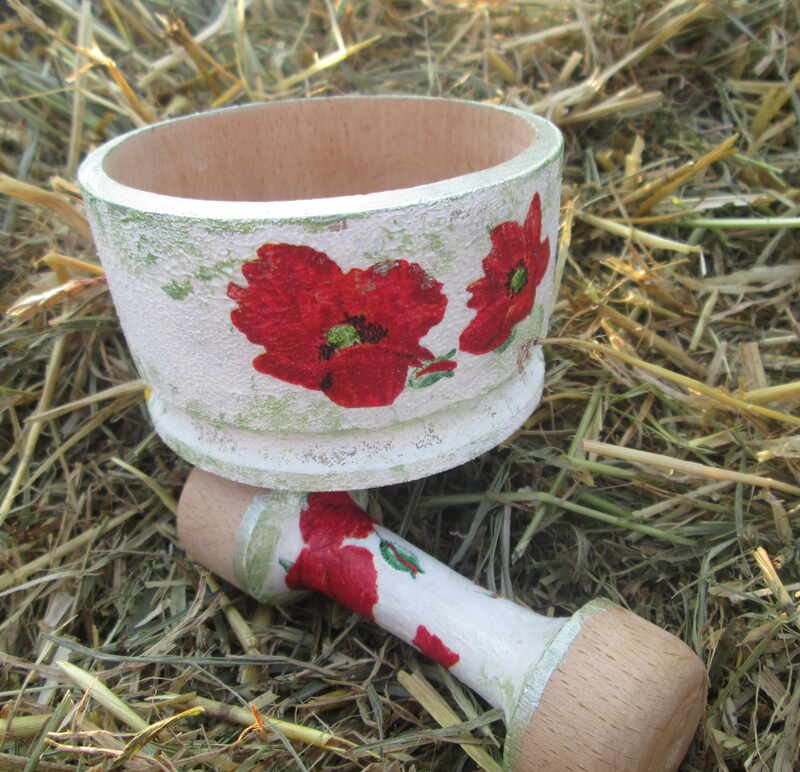 I have already posted my Ukraine stlyle poppy flower clip or head whreath you can buy in my Etsy shop. Poppy flowers are very Ukrainian. They grow freely on our fields. !!! Ukraine facts: it is illegal to grow poppies in your yard or garden in Ukraine. If you grow 1 to 100 plants, you get fine, if you grow more, you get to go to jail!!! So now I have decided to use them in wood decoupage on spice mortar and pestle. It’s a small spice mortar with pestle made out of wood. As usual, I repainted it with white water based paint and let it dry. 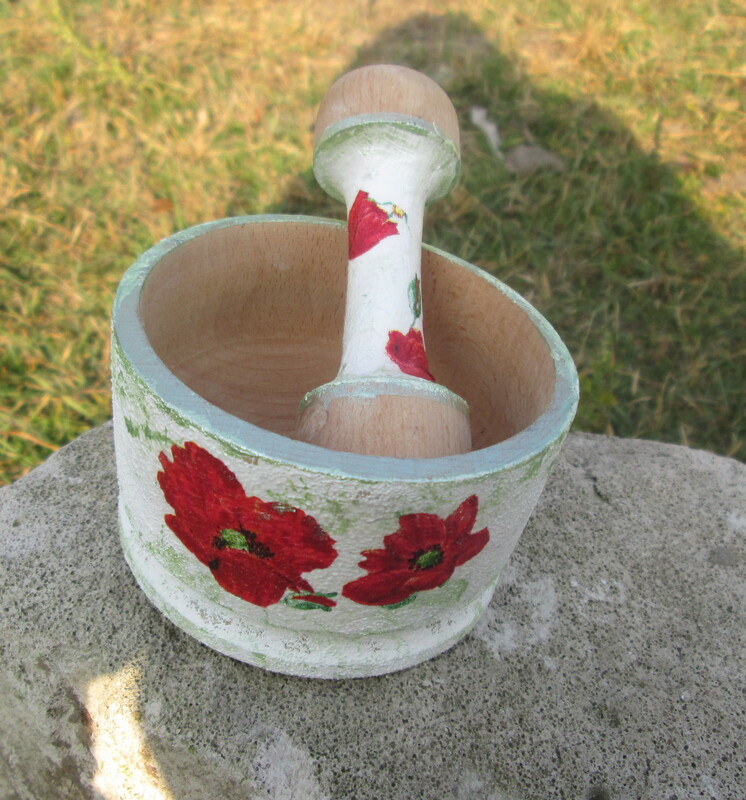 Then I cut out poppy flowers and glued them to the mortar. Finally I used green shiny paint and wood polish to cover it up. Now the pestle and mortar have become usable once again. But I think them very pretty, too. It is washable and usable. You can grind your spices in it and wash it with hot water. This set makes great and authentic gift. You can find it in my Etsy shop for a very appealing price. Feel free to Pin away. 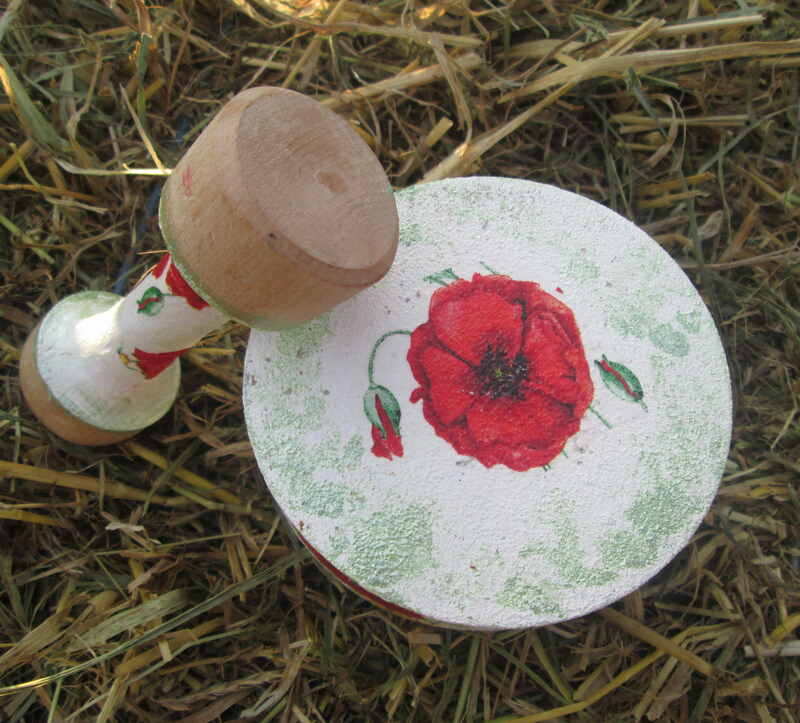 This entry was posted in Decoupage ideas and tagged Decoupage DIY, decoupage on wood, handmade, kitchen decor ideas, poppy flower decoupage, spice mortar, Ukraine facts, wooden pestle and mortar. Bookmark the permalink.